Here are some great activities for fall. Here is a song for teaching dividing fractions. How does this add to our teaching? How does putting this in our toolkit tap into spaces that digital learners inhabit? This is simply a song that serves as a mnemonic device to the procedure. You must make certain that along with things such as this that you teach students conceptually what they are doing. Students should be given real contexts of dividing fractions and have to represent their thinking and explain it. Along with that, then this type of song is an additional aspect of teaching and learning about dividing fractions. Remember to always make space for guided conversations in small guided math groups so that you can hear and see what individual students are doing! Also be sure to look at the Schultz Math Center Multiplication videos! Try some out and be sure to write me and share your thoughts about teaching different multiplication algorithms in your classroom! Remember that the Common Core emphasizes that students should have a variety of strategies and algorithms for the basic operations. What’s 12 x 15? How did you solve it? Now, solve it another way. Look at these resources to see different ways. These are great scaffolded graphic organizers to use when teaching the lattice method. Check out these examples. How is the term “Multiplication Wrestling” a student friendly way of presenting this strategy? Cluster Strategy of Multiplication. What do you think of this strategy? Is it helpful? Do you think it is efficient? Do you think it would help your students? Different ways and representations used to think about multiplication. It is important to spend time in small guided math groups talking with students about their thinking. Students need ample time to listen to themselves and others explain their mathematical thinking. They should also do word problems where they use one strategy to solve the problem and check it with a different one. The Common Core places an emphasis on different ways of arriving at an answer and being able to represent and explain one’s thinking. As a math consultant, working with students and teachers around the country, I am always looking for great resources. The new Math Dictionary for Kids, The Essential Guide to Math Terms, Strategies and Tables by Theresa R. Fitzgerald is just what I have been looking for! It is geared for students in grades 4 through 9 and filled with many useful math terms and strategies. I especially like that it has its own Quick Reference Guided to Fractions, especially since this is one of the areas of emphasis in the new National Math Common Core. This book is kid-friendly. I had my 5th grade niece take a look and she liked it! Now, that’s the true test. She liked that she could find and understand the “stuff.” I like that about the book too. I like that it is well-organized into topics that students need. I like that it is color-coded. I also really like the Learning with Manipulatives section because students and teachers often underutilize some of these great tools when exploring concepts. Finally, the various charts of arithmetic and measurement are a good resource to have right on hand. Overall, this is a very thorough and comprehensive resource for learning and reviewing mathematical ideas, terminology, definitions, and examples. The pictures, diagrams, graphs and charts help everyone to visualize the math and have greater access to the concepts. 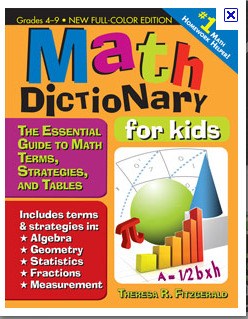 Schools are always asking me, “What should we buy for math?” I will now always include the Math Dictionary as one of the Must Have Resources!